Bob Casino Who shot the sheriff? 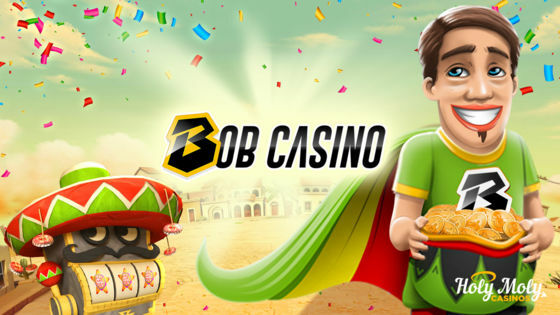 Bob Casino is one of the latest Direx N.V. online casinos, and Curacao licenses it. We should say that it’s one of the rare casinos with a Curacao license that has a nice reputation. As for Bob - he’s just an average guy who loves to smoke and spin reels. Also, he looks like a bleached Bob Marley but denies it in every possible way. No fear, Bob we’re on your side! As will see, Bob loves game variety, as he has more than 1500 of them in his casino. The providers are top-notch: Microgaming, NextGen, NetEnt, and Thunderkick. Their welcome offer is a bonus up to €500 and 140 free spins. These goodies are spread over your first three deposits, and the very first one is a 100% match, up to €100, and 100 free spins over four days. The WR’s are 40xB, so we consider this bonus offer fair enough. In summary, we can say that this casino is way better than we expected from a blunted guy in a funny hat. So, what about pot? If you’re not into it - you might find Bob Casino’s central theme a bit frustrating: it’s filled with dope. Joints, pills, drugs, pipes, and weed will follow you through each section of the website, supplying you with peace and relaxation. Do you get the overall idea? Ok, let’s stop here then. The site itself is fresh and modern but has a little tiny error. It’s easy to navigate, it doesn’t lag, and has everything you need for comfortable gaming. They have all games well-organized in four sections and also have an option to filter by software in the search bar. The bad news is that the search bar stops working after a few requests, so you have to refresh the page to make it work again. The casino is licensed by Curacao and has their fairness tested by iTech Labs. SSL security is also here, as it usually is. Seven languages are available including English, German, Russian and Swedish. The list of restricted countries includes France, Spain, the UK, and the US. Bob accepts Bitcoins, by the way, and the withdrawal limits for them are way higher than for other currencies. They have all their games well-organized in four sections: you can filter by software or use their search bar. Banking: The banking options are abundant: they have twelve options for deposit and eight for withdrawal including credit cards, Skrill, Neteller, EcoPayz, WebMoney, Cubits, and several others. All deposits are subject to a 2.5% fee except for Bitcoins, which have a fee of 0.2%. The withdrawal pending time is 0-2 hours and the total payment times are 0-3 hours for e-wallets, 0-24 hours for credit cards, and 1-3 days for bank transfer. These withdrawals are considered to be really fast, and Maria Casino, Casino Plex, and Spin Genie Casino can take a cue from this website. Customer Support: unlike Island Casino, the Support Service is available via 24/7 live chat and an online contact form. Not bad, but we’d like to see a toll-free phone number too. The trends chart doesn't reveal any significant insights. Yeah, people search for it. Sure, the popularity rises and falls month to month. We can only assume there's not enough data yet to see the global trend. We’re already tired of repeating it as we tend to say this a lot, but they have no video poker section! Come on, why not? The website is fully mobile compatible, so you’ll have access to it with no problem while you are smoking somewhere outdoors, at Woodstock for instance. The choice of live games is as good as the slots choice: more than sixty live tables with lots of options for Baccarat, Roulette, Blackjack, and one for Keno and Dream Catcher. Bonuses are fine at Bob Casino: they have no deposit free spins, a Welcome Offer, VIP rewards and some more. The Welcome offer is spread over the first three deposits and is up to €500 and 140 spins in total. The first deposit bonus is a 100% match, up to €100, plus 100 free spins over four days. The WR’s are 40xB. The Welcome offer is spread over the first three deposits and is up to €500 and 140 spins in total. Looks good, and what’s more is that there are no clauses in the T&C which rub us the wrong way. Oh, one bit of important information for you: Bitcoin deposits are not eligible for claiming any bonuses. Bob Casino is one of the few casinos that have no significant drawbacks, and we can open-heartedly say that they are on their way to the top-tier list. Their website is cool, and you can enjoy it even if you are not a pothead, or never enjoyed that kind of entertainment. The game library is fantastic, live games are abundant, and the payment times are impressive. The only significant drawback is a lack of phone support and country restrictions. Anyway, the casino is worth playing at. Click the Play button to claim your 100% deposit match bonus and free spins.